Slice the chicken breasts in half lengthwise, making thin cutlets. If the chicken is still more than 1/2 inch thick, lightly pound the cutlets until they are an even 1/2 inch in thickness. Sprinkle the chicken with the salt, pepper, and dried basil. Slice the cheese into 1/4 inch thick slices, slice the tomatoes into 1/4 inch thick slices, and slice the fresh basil into thin shreds. Set on a plate next to the stove. Warm a large stainless steel skillet over medium high heat, add the oil and heat until shimmering. Add the chicken in a single layer across the skillet. Cook without touching for 90 seconds. Reduce the heat to medium. Flip the chicken over and top each piece of chicken with cheese and then tomato slices and cover with a lid. Cook an additional 2 to 3 minutes. The cheese should be just beginning to melt over the chicken. Remove from the heat, uncover and test the chicken for doneness. It should be white throughout with barely a hint of pink. 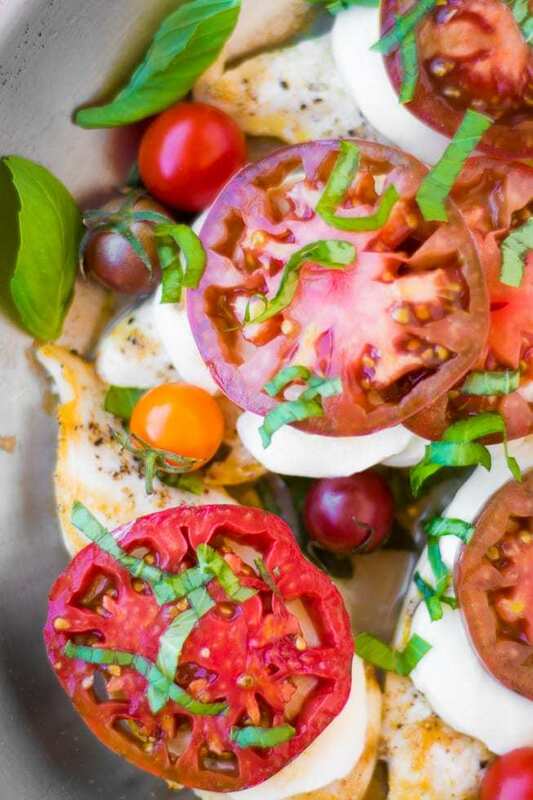 Sprinkle the tomatoes lightly with a pinch of salt and pepper and top with the fresh basil. Drizzle with the balsamic just before serving.